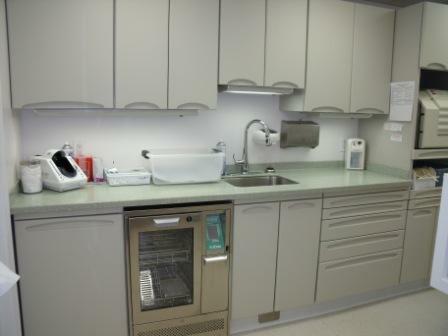 The most recent addition to the office is the brand new, state-of-the-art sterilization room. 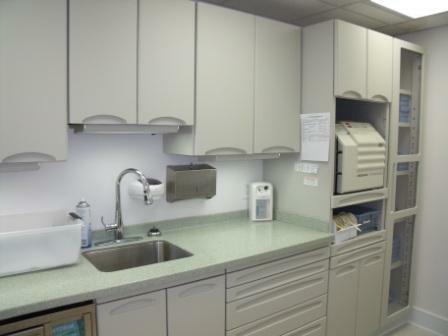 We take our infection control seriously and invite you to tour our facility and see for yourself. We use a cassette system for our instruments,which helps minimize handling of the contaminated materials prior to sterilization. The cassettes are put through an instrument washer, dried, and then wrapped before being placed in the autoclave for sterilization. After going through the sterilization cycle, the cassettes are stored in this same protective wrap until the patient is brought into the operatory. The autoclave is tested weekly by an outside, independent lab for efficacy. Additionally, every sterilization pouch has both an inside and outside test strip as required by OSHA. In our effort to "Go Green" in the office, we have eliminated the use of any Glutaraldehyde products and instead use either barriers for all "touch" areas or disposable products if necessary. All of our handpieces are sterilized between every patient, and always have been. The dental burs in the handpieces are single use only and then discarded. These are a few of the ways we work behind the scenes to assure that you can have full confidence in our ability to provide the highest standard of care for you and your family. If you have any questions at all about our products or sterilization procedures, please just ask!